This Greek potato casserole is a lemony oregano filled roasted potato dish filled with all the elements of a Greek salad. I have to admit something. I’m the wife of Greek guy and I really dislike oregano. I feel like that’s potential grounds for divorce to Greeks. Good thing I don’t want kids because that whole name everyone after your parents which results in like 4 family names just going on and on and on down the generational chain…yeah, no. Those are two acts of defiance I’m pretty sure would not bode well within the family. But then my mother in law brought a huge jar of fresh oregano to our house from Greece this past July and my entire world was rocked. Fresh from Greece oregano is quite different than “sat in the spice aisle at the supermarket for a year” oregano. It’s bright, not nearly as “bad Italian food” smelly and the whole inspiration for this Greek potato casserole. Roasted potatoes are a staple in our family winter meals but they’re always served as a side dish. This casserole, makes them the star of the show but adds all the elements of a Greek salad with lemony baked chicken for a well rounded meal. From crispy roasted potatoes to salty feta to kalamata olives and juicy tomatoes, each bite has just a hint of oregano throughout and yet I love it. Like most things in life, quality stuff makes a difference. 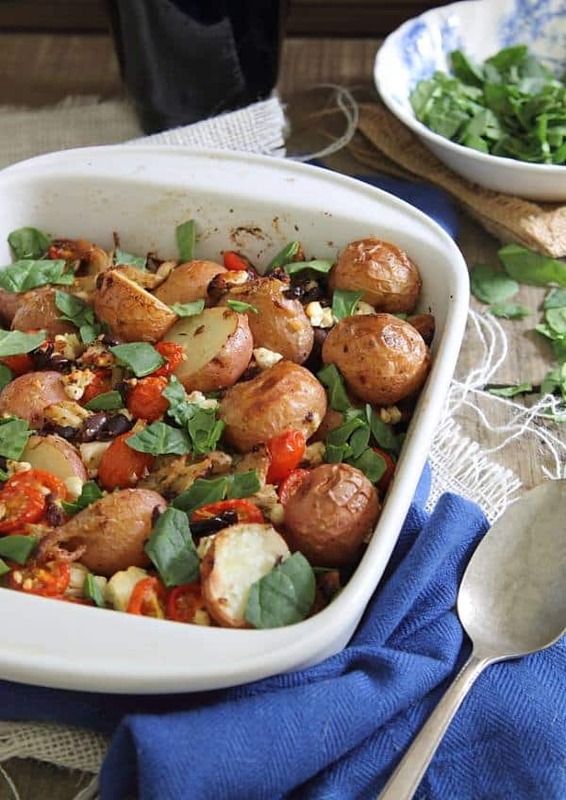 You can grab the recipe for this Greek Potato Casserole on the Potato Goodness site developed for the United States Potato Board. It’s also going to be featured in this coming month’s issue of Food Network Magazine if you’re looking for a good reason to pick up a copy! I would SO rather be eating this than stuffing. Roasted Potatoes + Greek flavours? This sounds absolutely amazing Gina! Love the photos too..as always. Pinned! 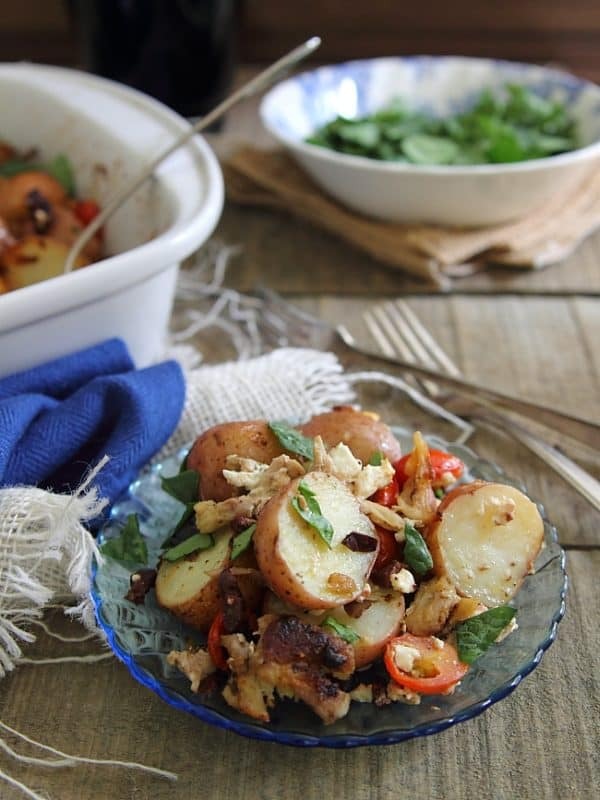 I love roasted potatoes with herbs and the added ingredients… YUM! PInning now! I’ve never had anything like this dish before– can’t wait to try it- thanks! How tasty! Looks like a great dinner idea! oh my gawd, congrats on being featured in this coming month’s issue of the Food Network Magazine!!! Wow, so cool!!! and love this greek potato casserole!!! Where are the average person living in phoenix suppose to find this kind oregano. You don’t need fresh from Greece dried oregano for the recipe, any dried oregano will do. This looks amazing! Love the fresh oregano! I am all for making potatoes the star of the show!! This casserole looks like my kind of meal, although come to think of it, I’m not sure if I’ve ever had fresh oregano. I’m ready for my world to be rocked, though! you’re in Grenada. I’ve decided I hate you, because it’s ICE RAINING here. Oh yes, my Greek parents about disowned me when I didn’t name any of kids after them! They managed to get over it. And you are right, Greek oregano is something special. Perfect potatoes Gina! In my opinion, 1/2 lb chicken isn’t nearly enough for this dish; the meat would get lost among the potatoes. I used 3 thighs (1.5 lb with skin and bone, which I removed before cooking). That amount of chicken was barely enough. 1 hour in the oven wasn’t even enough to soften the potatoes, let alone make the edges crispy. I would consider pre-baking the potatoes alone, while cooking the chicken. Maybe use the broiler for the rest (using a larger 9×13″ pan, so the potatoes aren’t so piled up).